Sometimes photo competitions annoy me, they have a vague theme and to enter you just have to tag your photo with something and like two different instagram/facebook feeds, but occasionally there’s a good one with a proper theme you need to think about and prize that makes you want to try your best. This latest one from light field camera makers Lytro has the best prize I’ve seen in a surf photography related competition, and great judging criteria that will make you think, but unfortunately it’s limited to US citizens (but not residents of Maryland) and requires that you pre-order their latest Illum camera (Special introductory price of US$1,499) in order to enter. a once-in-a-lifetime, all-expenses paid, behind-the-scenes photo shoot with Lytro and Chris Burkard in Iceland! The trip is 3 days, 2 nights, so a quick one, but you get $1500 to cover your expenses, so maybe you could fork out a bit more or stay somewhere cheap and extend your stay a bit before or after the prize photo shoot event. That is an awesome prize, I have seen Chris Burkards photo’s of Iceland in his latest book Distant Shores and it’s a stunning place, I’m not sure if this would be in any way surf related but I expect you could squeeze some in if you were one of the winners. Be 18 or over, pre-order an Illum camera via the Lytro website, be from the US – but not Maryland (because of some weird law I think? ), fill in a form and submit 3 photo’s. 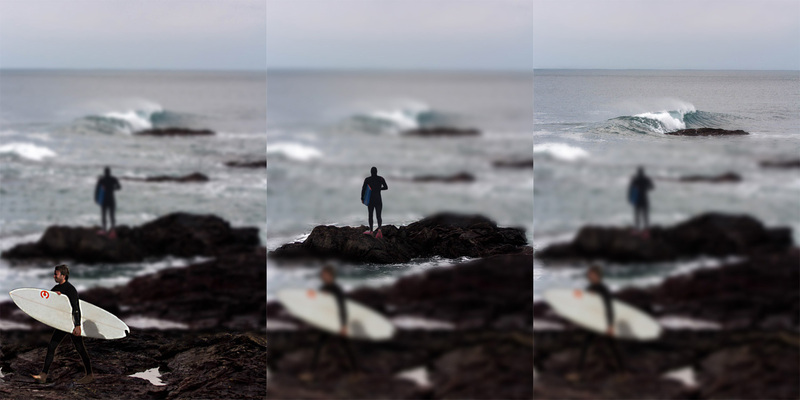 All three images must be of the same visual scene, captured from the same angle, with the same exposure and lighting, but the focus should be distinctly different in each image. Your images must demonstrate how you would use the Lytro ILLUM’s refocus ability to tell a unique visual story. Example from Lytro – I couldn’t find a photographer credit, see the original here. So the story here is – man looking at the woman from the back seat, woman realises he’s behind her, man makes creepy eye contact, I think the third shot is the strongest and works quite well on it’s own, but I see the way this works, it’s cinematic without being in motion, maybe I’m old school but I’m not sure this whole story telling gimmick is all it’s cracked up to be, I could achieve a similar effect by shooting video on my DSLR. Not having to worry about focusing at the time is a massive plus though, so in a few years when they’ve built this into the sensor on my DSLR mirrorless camera body I could do this shot in post rather than pulling focus manually at the time, that’s useful, right now is it just a weird niche? Naturally after seeing Chris Burkards name involved I got to thinking about a three image sequence that could work well with surfing in mind, I think you’d have to do a landscape style shot, or at least a fairly long water shot, something with a narrow depth of field, luckily I was using my 70-200mm in the surf this morning so I’m a little more inspired. Unfortunately you can’t just re-create the same wave 3 times for the sake of this competition, but I can spend 15 minutes in photoshop botching something together (I’m not eligible on several counts for the competition anyway so feel free to borrow my, no doubt finalist worthy, idea).